Recommended to us by a woodturner who has been using it for years, we found this finish to be easy to apply with excellent results. This thick body finish can be recoated in just 4 hrs. and will be dry by the next morning. Similar to a rubbing varnish, Master Gel will impart a slight darkening of the wood but will bring out the grain subtleties. It is water and alcohol resistant. 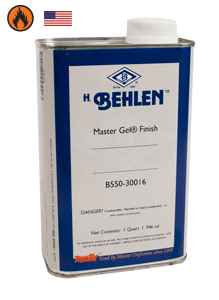 Master Gel can be built up to a gloss sheen or buffed out with steel wool or hand pads to a semigloss. This item is flammable. It cannot be shipped by air or through the United States Postal Service.